El Reg has been sent a copy of a letter from EMC to its Velocity channel partners saying disk drive prices will rise 5 to 15 per cent from 1 January, 2012. It is apparent the price rise is due to drive shortages caused by the Thailand flooding. This has caused retail drive prices to rise and impacted many disk drive OEM deals as well. However, no major storage array or server supplier has, until now, signalled that they will have to raise prices too. The tragic, persistent flooding in Thailand has impacted the cost of hard disk drives in the global marketplace. EMC typically adjusts drive pricing on a quarterly basis, passing through cost changes from our suppliers, usually in the form of lower drive prices. In Q4, EMC did just that, absorbing the cost increases in order to shield our partners and customers from the impact of higher drive pricing. We have determined however that we must raise prices in Q1 for an indefinite period of time in order to offset the continued high drive prices we are seeing from our primary suppliers. As a result, our Q1 2012 HDD list prices will rise between 5-15% over Q4 2011 levels. 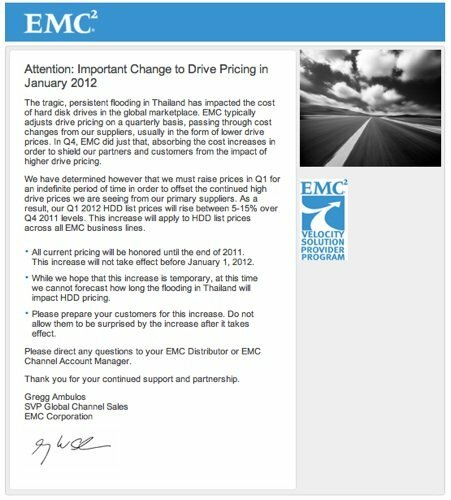 This increase will apply to HDD list prices across all EMC business lines. All current pricing will be honored until the end of 2011. This increase will not take effect before January 1, 2012. While we hope that this increase is temporary, at this time we cannot forecast how long the flooding in Thailand will impact HDD pricing. Please prepare your customers for this increase. Do not allow them to be surprised by the increase after it takes effect. Please direct any questions to your EMC Distributor or EMC Channel Account Manager.